The modern deep graphite gray of this kitchen is softened with a velvety matte finish. Tongue and groove and a pared-back classic door style create the perfect compromise between modern minimalism and a relaxed traditional look. The slim “Snow” worktop creates the perfect, cool contrast with metallic-gloss accents that catch the light. Beautiful and practical, this finishing touch replicates the cost of polished quartz without the price tag! The dark furniture gives this kitchen an air of sophistication with an elegant twist. 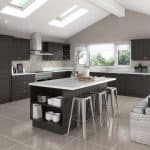 With over 40 years in the fitted kitchen industry, we now deliver to over 15,000 homes in the UK. We design, make and install all of our products, ensuring you get the best quality products, prices and service. 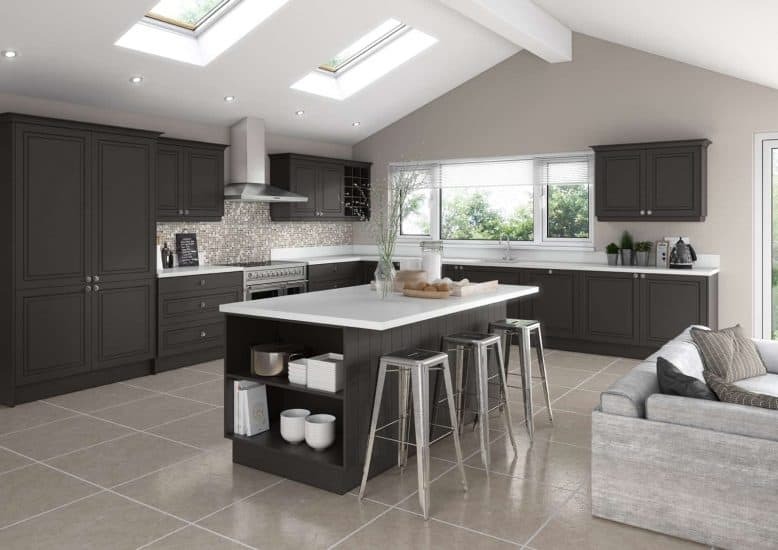 We know financial pressure can be a reason for putting off that new kitchen you’ve got your eye on, which is why we offer finance packages, as well as offers on many of our designs. We would expect value for money with whatever we would buy, so why would we not extend the same courtesy to our customers?